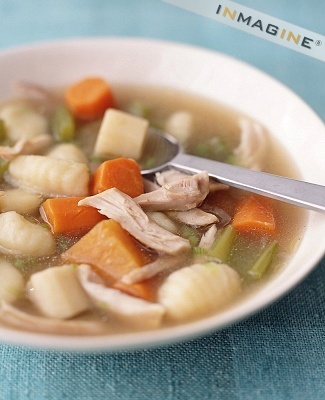 Sing to Life: Easy, hearty chicken soup with homemade dumplings - I think they're called NOODLES, but whatever. 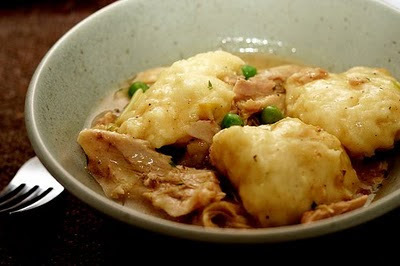 Easy, hearty chicken soup with homemade dumplings - I think they're called NOODLES, but whatever. This is the soup I've made for a couple years now, and I usually substitute carrots, celery, and onions for the vegetables in the recipe. It's wonderful. The dumplings are fluffy and flavorful, and although the soup is a bit of work, it's definitely worth it. Turns out, though, that when Brian hears 'chicken and dumplings', he thinks of something else. One day, he said, "You should make dumplings the way my mom does." Thinking he meant the flat, noodle-type things that some people consider 'dumplings', I said, "You mean chicken and noodles? I've made that before." Nope, that's not what he meant. What he grew up eating was not a thick stew with fluffy biscuit dumplings but instead a brothy soup with small, dense, gnocchi-size dumplings. So I set off to find a recipe that fit that description, which sounded suspiciously like noodle dough cut into a different shape. Anyway, I found out that the dumplings Brian grew up eating are also delicious, and a bonus is that the soup is much easier to make. It's perfect for a winter afternoon. Start it in the morning so it has time to develop the flavors. Several hours before you want to eat, slice the celery and carrots on the diagonal into pretty-looking pieces. In the empty pot, melt a tablespoon of butter, throw in the vegetables and a sprinkle of salt and soften them over medium heat for ten minutes, covered. When they are tender but not mushy, remove them with a slotted spoon into a bowl. Cover and refrigerate for later. Dice the onion and add another tablespoon of butter to the pot. Cook the onions over medium heat for five minutes until they are translucent. Remove the onions to a plate, just for a little while. Remove all skin and fat from your chicken. Over medium-high heat (add a little olive oil if there is no remaining fat in the pot), brown the chicken well - about four minutes on each side. Brown=flavor. When the chicken is sufficiently brown to your taste, fill the pot with enough water to come about two inches from the top. Stir well to loosen the brown bits from the bottom of the pot, and throw the onions back in there. Bring to a boil, then cover and reduce the heat to low, or just enough to gently simmer. What will happen now is that the chicken will cook through and become soft, and the meat and the chicken bones will give the water body and flavor (making broth). Let it simmer for an hour or two - the longer, the better, so if you want to let this happen in a crockpot while you're at work, PERFECT. When the chicken is soft, remove it and separate the meat from the bones. Chop it into chunks and return it to the pot. Taste the broth and add salt gradually until it's perfect. For the dumplings, mix the flour, salt, and water together until a smooth dough forms. You can do this in a mixer, food processor, whatever - or go old-school and use a wooden spoon. When it's all smoothly mixed (it shouldn't be sticky), use your hands to smush the dough onto a floured surface about a half-inch thick. Use a pizza cutter to cut it into strips about an inch wide. You might have seven or eight strips, but it'll be enough. Only, of course, they have no fancy scalloped sides. Who cares? Add the carrots and celery back into the pot, on top of the dumplings you just snipped into the broth, and put the lid on top. Let them boil about five minutes. Finally, ladle and serve. Top with a TON of black pepper, which is delicious, but may just be my personal taste. I know this sounds like a lot of instruction, but it's really very easy. Please forgive the lack of picture, and try it anyway. You will thank yourself.